The Sinfonia CS2 printer is one of the world's smallest and lightest photo printers in it's class, while still maintaining excellent print quality, durability and fast print speed. The compact design enables you to use this printer for your photobooth, ID system, mini kiosk, event / photo, amusement and theme park photo, etc. The printer will produce cut a 4x6 into two 2x6 strips, perfect for photo booth applications. Print Sizes: 2 x 6" up to 6 x 8"
Print Speed: 4 x 6" prints in under 11 sec. The Shinko Sinfonia Color Stream CS2 printer can print a glossy 4x6 print in under 11 seconds. Designed for performance and portability, the Shinko Sinfonia Color Stream CS2 is light weight with a small in footprint. 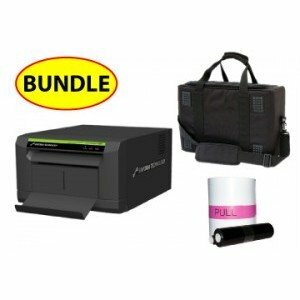 The Shinko Sinfonia Color Stream CS2 printer weighs only 22 pounds and it's dimensions are 10.7 inches wide by 13.3 inches deep by 6.6 inches high. The Shinko CS2 printer is capable of printing 2x6 strips on 4x6 media, making it a perfect printer for Photo Booths. You can receive the KG Instant Print Software ($499 retail value) for FREE with the purchase of a Shinko Sinfonia Color Stream CS2 printer. The KG Instant Print software automatically rotates, resizes and prints images from a hot folder. Images can be placed into the hot folder by using a tethered camera, drag and drop into the folder, or via a wireless (wi-fi) camera. Multiple Print (6" x 4") x 2 witd 6" x 8"